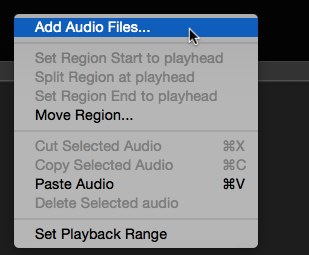 Audio files can also be added to specific tracks in Revoice Pro. This function is accessed from the contextual menu obtained by RIGHT CLICKing on any track. The audio file thus loaded will go to a location determined by the same rules as for drag-and-drop files. Spot to specific times also works for this method.